Guest Post By Claudia Heilter, former news producer, mother of Arlo, 6 and Lois, 4. I’ve been wracking my brains on ways to pass along my Hungarian roots to my children. I speak the language but found it a bit too tricky to teach them. My husband doesn’t speak it and my parents live 2,000 miles away in Western Canada. It only dawned on me recently that it might be easier to pass along the family history not through the language, but through the food. Hungarian cuisine is so flavorful that it’s world-renowned. It’s quite kid-friendly too because most of it qualifies as comfort food: goulash soup, paprikas chicken, palacsinta (crepes) and galuska dumplings (instant homemade noodles). The only problem is, I can’t cook. I’ve been a stay-at-home mom for 6 years and the learning curve, for me, has proved too steep. I thrived working in the high-pressure, cut-throat environment of network news. But ask me to follow a simple recipe and it’s like my brain goes cross-eyed. 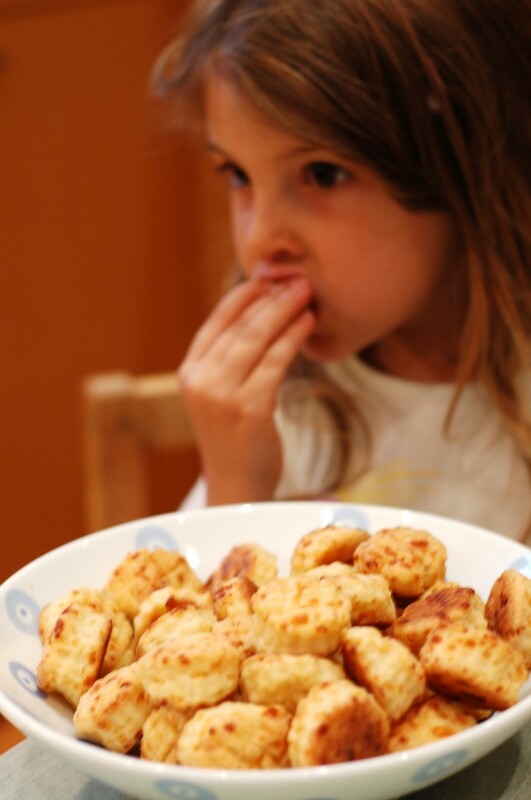 My kids love the buttery, bite-sized Hungarian cheese biscuits called pogacsa (po-gah-tcha) — a treat my mother makes every time we visit my parents. (You can’t be Hungarian and not have put your personal stamp on a pogacsa recipe.) Arlo and Lois beg their grandmother to send them some instead of having to wait until our bi-annual visits. But by the time the pogacsa would travel the two weeks and go through Customs (if it even got through Customs), they’d undoubtedly be stale. So I thought, Hey! I’ll just make them myself! What a great way to pass along some part of my family history. But as soon as my mother started to explain the measurements in terms of “it needs a little bit of this and a little touch of that” I thought to myself: Doomed. If I can’t work with actual measurements, I certainly wasn’t going to be able to go by feel. Now what? What I would have done in my producer days: Find an expert! I admit I’m a bit embarrassed to be outsourcing my heritage. My friend and neighbor, Lori Walsh, though not Hungarian, is a gifted baker. And in this case that seems to be the more important criteria. She already bakes bread for us weekly and other yummy snacks and desserts, too, through her business Yum! So why not this? I connected her with my mom (it seemed best to cut out the middleman), and we were in business. Until the day comes that my mother teaches me her way, delegating this old-world tradition will have to be my modern-day stamp on the pogacsa recipe. In the meantime, there’s a little taste of Hungary, and a lovely (mess-free) reminder of my family, anytime we want. 2. Mix the butter into the flour mixture on low speed until butter pieces are about the size of peas. Add the mashed potato to the flour-butter mixture. Mix until combined. 3. Mix the sour cream and egg yolk in a measuring cup until combined. Add to the flour mix and mix and low speed until it comes together. 4. Add the cheese to the dough and mix until combined. With well-floured hands, give it a few kneads. 5. Cover with plastic wrap and let it rest 2 hours. 7. Divide the dough into two pieces. On a well-floured surface, roll out the dough until 1/2-inch thick. Make thin horizontal and vertical cuts about 1/4 inch apart in a cross hatch pattern. 9. Bake in middle rack for 20 minutes or until golden brown. Mmmm, those sound delicious. Perfect for a rainy day. My mother’s signature dish was her macaroni and cheese, for which she made the roux and the whole nine yards. Despite years of practice, I was never able to replicate it, and started branching out and finding other recipes until I found one I also loved but without all the work and disappointment over it being not quite the same. Adapting family food traditions is a beautiful thing–thanks for sharing these! Those sound so good! Sadly we are in the middle of an oddly timed heat wave out here in San Francisco so all oven-related projects are being put aside for now. But I have it filed for fall to eat with some chowder or minestrone. Thank you for sharing! Oh wow, I couldn’t agree more. I’m definitely not in touch with my culture – and while my folks are quite traditional and conservative, I think their culture shows through more in their morals than, I don’t know, any rituals and practices they might have. But food! Yes, food, I think, is the best way to retain culture. It makes me a little sad that I can’t recreate all of the foods that remind me of childhood. I just purchased your cookbook, “time for dinner” and I had to comment on how much I LOVE it. The recipes are wonderful. As a mom of three grown children, I wish I’d had this 15 years ago, but purchased it because your (newly discovered from the article in Whole Living) web ideas were so wonderful, I knew I could find quick things to make that were healthy and tasty, even it if is just my husband and myself, or if the kids come by, I can come up with something. Not everyone has the gift to come up with something on the fly. I love the section in the book where you use what you have. You have eggs………., you have canned tomatoes……with three different ideas, inspiring!!!! Instead of just standing there peering into my pantry and ending up eating a bowl of cereal I can actually cook something. Thank you and will you post the recipe for Grama Turano’s meatballs sometime. Please. Great post! These biscuits sound delicious and this seems like a wonderful way to share your roots with your kids. Oh. my. goodness! My Memaw used to make these (along with the BEST Hungarian goulash) and this brought back such amazing memories! (My family immigrated from Bohemia in the late 1800s.) I’m going to have to look up her recipe and see how similar/different they are. Thanks for posting this! I can only applaud the appearance of Hungarian recipes on DALS, and these pogacsa look very tasty indeed. One hair-splitting clarification. These pogacsa are slightly smaller than the standard issue pogacsa of my misspent youth in Budapest. Lately, in fact, a regrettable super sizing tendency in Hungary has resulted in giant pogacsa mutants served in many establishments. These mini-pogacsa are properly classified as “aprosutemeny”, or “mini baked goods” offered at Hungarian pastry shops. They are served as an afternoon snack. I would love to get my hands on a batch myself. I love pogacsa.Unfortunately I haven’t been able to enjoy them since I left Hungary in the early 1980s.I cook and bake lots of Hungarian dishes but I never watched my Mother make these when I was a kid,I just scarfed them down when they were done.She made lots of varieties too,adding and changing the ingredients.I distinctly remember pogacsa made with bacon.Thank you very much for the recipe.I will be trying it out soon. I tried this recipe yesterday and they taste delicious. Just one clarification, how is the texture of the biscuit supposed to be like? Soft and chewy or crisp and slightly crumbly? Mine were slightly crunchy when they came out of the oven and are now soft and chewy (yet delicious!) the morning after although I stored them in an air tight container. Oh I LOVE pogacsa! My Hungarian grandma has tried to tell me how to make them, but the recipe is in her head and she does not use measurements. I’m like you, Claudia; I can’t cook either, which to my grandma’s generation is akin to sacrilege. 😉 But I will try this and see if I can get it right. Can’t wait to make these! I know my kids are going to LOVE them. My grandmother made shortbread-like cookies that she called pogascas. It’s a simple dough made with lots of flour(6 cups), margarine, egg yolks,sugar, and orange and lemon juices. I only learned as an adult that they looked like biscuits so she called them pogascas! I miss her and her wonderful cooking! Thanks for posting this. It’s been a million years since I’ve had pogacsa. Do you know if these freeze well? Thanks so much for your recipe…. i am going to try it out. It sounds like something from my forgotten past! My grandparents immigrated from Hungary in the 1920’s. As a child i spent many days in her kitchen watching her fling things together for a marvelous meal or baked good. Cups of flour were measured by hand. Back then it seemed so effortless but as an adult today- I too would need to have a structured recipe for some of her delicacies … cabbage strudel being a favorite or her fried potato pancakes 2″ wide and served with jam (i can no longer pronounce the german/hungarian name for them).